A year or so ago, I received a Lilly Pulitzer copper cookie cutter shaped like a shift dress as a gift with purchase. I just adore this cookie cutter and love to make treats with it. Several friends have borrowed this cookie cutter from time to time and have never been able to find one of their own. Recently, I discovered this cookie cutter online at Copper Gifts! How thrilled was I to discover this!! These cookies are adorable for a Lilly themed party, bridal or baby shower, or any fun, preppy event. Lots of lucky friends will receive this gift in the near future because I ordered quite a few of these. Attached to a home made cookie mix in a jar, this cookie cutter would make a great hostess gift. Who will the lucky hostesses be??? These cookies are so cute with a sprinkle of pink and green sugar, but they look outstanding with icing. I've used royal icing in the past, but prefer a different kind of glaze for the cookies. 1. Stir confectioners' sugar and milk together until smooth in a small bowl. 2. Then, beat in corn syrup and vanilla extract until icing is smooth and glossy. 3. If the icing is too thick, add more corn syrup. 4. You'll have to stir for several minutes. 5. Divide into individual bowls, and add food colorings to each bowl to make each color. 6. To decorate you can dip the cookies, or paint them using a small brush. The glaze dries hard and is so pretty and shiny. I love being able to stack the decorated cookies on top of each other or putting them in cellophane bags without worrying about messing up the decoration. This does take some time to dry and is a little sticky, but the results are fantastic and look so professional. I'm partial to vanilla extract, but I'm sure that this would taste delicious with almond or lemon extract. Let me know how these turn out for you. What kind of cookies do you like to decorate? Do you have any special cookie cutters in your collection? I bought the shift cookie cutter last year from Copper Gifts. I've only made the cookies once, but they were adorable! I used a variation of the glaze recipe and I was able to stack them. 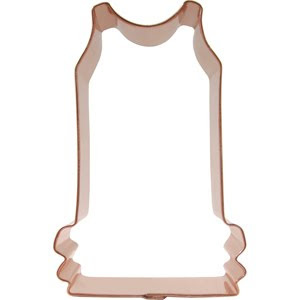 Thanks for the heads up on this cute cookie cutter- just ordered it! My daughters bday is coming up and these along with the Lilly animal crackers will be great goody bag fillers! What an adorable cookie cutter! Thanks for sharing...I will definitely be buying one of these for me (and probably several for gifts)! I had never seen this before. How fabulous. A must have. I can imagine the fun my daughters and I will have decorating our cookies. Many thanks for sharing. So adorable! What could be better than a cookie? A shift cookie! How adorable!!! I have to get them now! :) Thanks for sharing! I can't wait to get them and make some yummy cookies and try your glaze icing. They're going to be so fun to decorate!!! How cute! Those would be perfect if making cookies for a wedding shower or girly birthday party. Fun! The minnies are going to be so excited to decorate their little shifts! I've been meaning to order this cookie cutter for ages! It's so adorable. I make a similar glaze and prefer it over royal icing as well. Thank you so much for this post!!! I have seen these finished cookies before, but none of the people who have the cutter could ever help me figure out where to buy it. Happy Day! Cute cookie cutter! I had to take a look at the website and found a South Carolina one too... I'm really going to have fun looking at this site. Thanks so much, dahlin'! That is definitely the cutter to have for Lilly Shift Lovers, I love seeing your recipe to make the frosting shiny, thank you for posting it! LOVE my shift cookies cutters as well (mine were both GOPs too!)! I did this post last year as soon as I found the cookie cutters- we have to spread the LOVE!